This item might ship with US Postal Service or UPS. this is a 2-pack, you get 2 units per order (while supplies last). 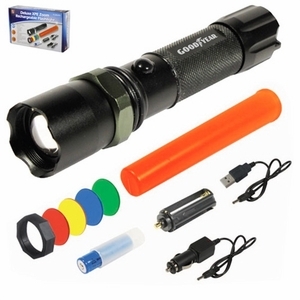 Rechargeable Flashlight with 4 different color rings and orange Safety Wand. This is a great tool for home, automobiles, emergencies, camping, outdoor activities, directing traffic etc. The USB charge cable attaches to your gadget charger and keeps this flashlight ready to go at a moment's notice. Plug it in at home or in your car to have a flashlight and orange cone safety wand available when needed. The optional color rings can be used for signalling purposes. Multiple charging options are the included car charger, the USB rechargeable battery pack, or you can use your own batteries with the use of the included battery holder.